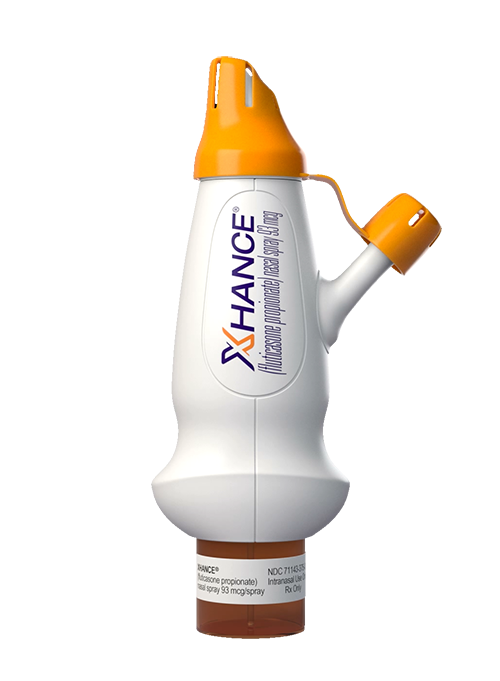 XHANCE is a corticosteroid indicated for the treatment of nasal polyps in patients 18 years of age or older. Scroll down to explore reasons to prescribe XHANCE. Full Prescribing Information for XHANCE (fluticasone propionate). OptiNose US, Inc.; 2017. Data on file. OptiNose US, Inc.
Zhong C, Jiang Z, Zhang X. Effect of distribution of nasal polyps in ostiomeatal complex on long-term outcomes after endoscopic surgery. Eur Arch Otorhinolaryngol. 2015;272(12):3757-3762. Larsen PL, Tos M. Origin of nasal polyps: an endoscopic autopsy study. Laryngoscope. 2004;114(4):710-719. Djupesland PG. Nasal drug delivery devices: characteristics and performance in a clinical perspective—a review. Drug Deliv Transl Res. 2013;3(1):42-62. Liang J, Lane AP. Topical drug delivery for chronic rhinosinusitis. Curr Otorhinolaryngol Rep. 2013;1(1):51-60. Leopold DA, Elkayam D, Messina JC, et al. NAVIGATE II: randomized double-blind trial of the exhalation delivery system with fluticasone (EDS-FLU) for nasal polyposis. J Allergy Clin Immunol. 2018; In press. Hypersensitivity to any ingredient in XHANCE. Local Nasal Effects: epistaxis, erosion, ulceration, septal perforation, Candida albicans infection, and impaired wound healing. Monitor patients periodically for signs of possible changes on the nasal mucosa. Avoid use in patients with recent nasal ulcerations, nasal surgery, or nasal trauma. Close monitoring for glaucoma and cataracts is warranted. Hypersensitivity reactions (e.g., anaphylaxis, angioedema, urticaria, contact dermatitis, rash, hypotension, and bronchospasm) have been reported after administration of fluticasone propionate. Discontinue XHANCE if such reactions occur. Immunosuppression: potential increased susceptibility to or worsening of infections (e.g., existing tuberculosis; fungal, bacterial, viral, or parasitic infection; ocular herpes simplex). Use with caution in patients with these infections. More serious or even fatal course of chickenpox or measles can occur in susceptible patients. Hypercorticism and adrenal suppression may occur with very high dosages or at the regular dosage in susceptible individuals. If such changes occur, discontinue XHANCE slowly. Assess for decrease in bone mineral density initially and periodically thereafter. The most common adverse reactions (incidence ≥ 3%) are epistaxis, nasal septal ulceration, nasopharyngitis, nasal mucosal erythema, nasal mucosal ulcerations, nasal congestion, acute sinusitis, nasal septal erythema, headache, and pharyngitis. Strong cytochrome P450 3A4 inhibitors (e.g., ritonavir, ketoconazole): Use not recommended. May increase risk of systemic corticosteroid effects. Hepatic impairment. Monitor patients for signs of increased drug exposure. Please see full Prescribing Information and Instructions for Use at www.XHANCE.com. You are now leaving the XHANCE HCP website. Are you sure?